This post was updated on August 29, 2017! Do you love Jack Hartman as much as I do? 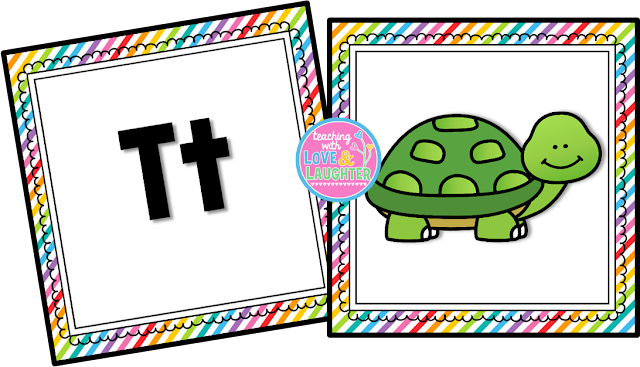 I own a lot of his CDs and year after year, his song, Learning Letter Sounds, is always a crowd pleaser! If you don't already own "Shake, Rattle, and Read", and "I've Got Music in Me", then you must get one or both. Combining singing, movement, and learning is a sure fire way to help children retain information. After all, I can't remember what I ate for dinner yesterday, but you can bet I remember songs I was taught in elementary school! 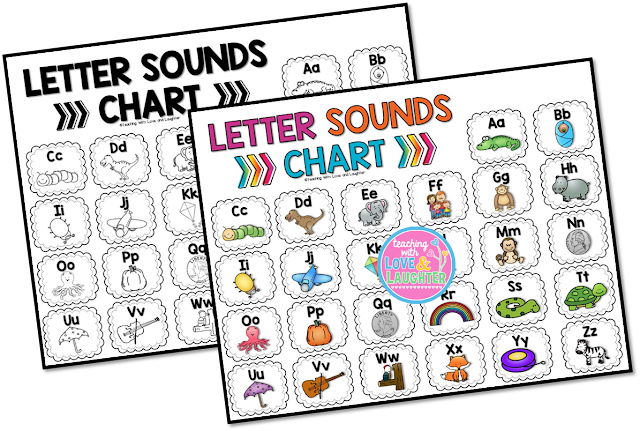 I recently updated my Learning Letter Sounds pack, which is filled with so many fun activities. I changed the clip art and some fonts and I LOVE how it came out. 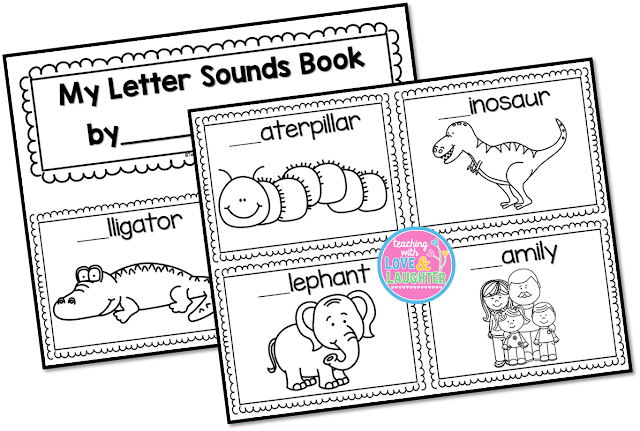 One of my favorite parts of this pack, is the BIG poster size letter sounds chart. All you do is print the pages, laminate them, and tape them together to make a poster. 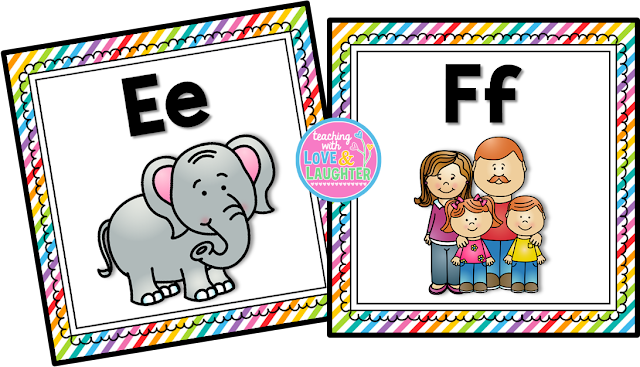 I use a pointer and point to each letter as we sing the song. The children love to use the pointer, as well, so I often have the leader of the day be in charge of the pointing. 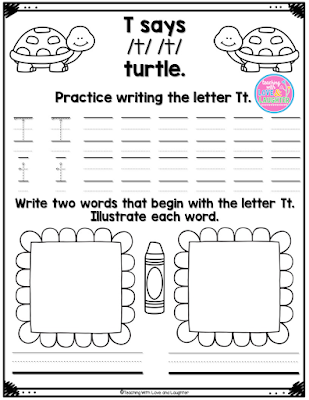 The pack also includes personal sized letter sounds charts, in color and black and white. Each child has a black and white one in their writing notebook and I keep a stock of the colored ones at each station. They really come in handy! 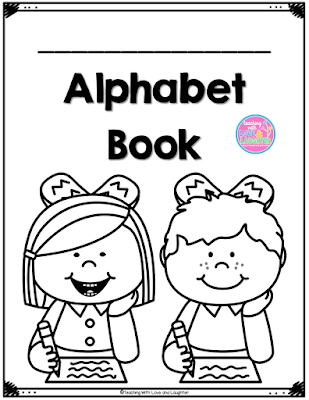 Also included, are three different handwriting books. The one pictured below can be printed in color or black and white. I keep the colored version at a station. 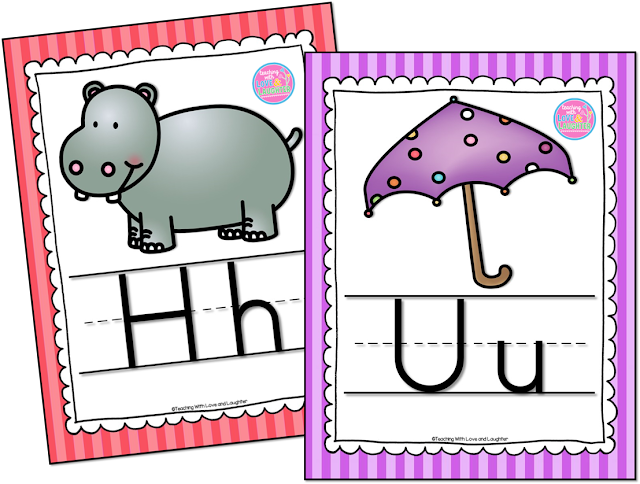 It's laminated, and the children use dry erase markers to practice writing the letters. When they are finished, they erase them. I have the pages held together with a large ring. actually contains the words to the song. I love this book because I know the children will have success reading the words to the song. 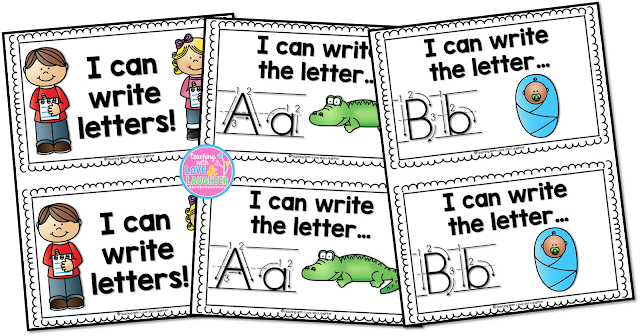 They can also practice making a few capital and lower case letters, as well as, write 2 words that begin with the letter. Lots of skills being practiced here! Each student has a book and we fill out a page together each time we discuss a new letter. Here's another book included in the pack. I photocopy the pages double sided and staple them. 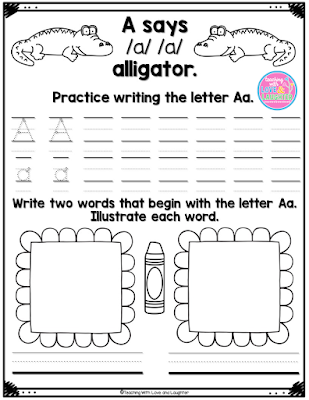 Each student has a book and they write in the first letters and color the pictures. This is great for when you have a few minutes to kill or when the students first arrive in the morning. I also included some flashcards and a fun memory game. 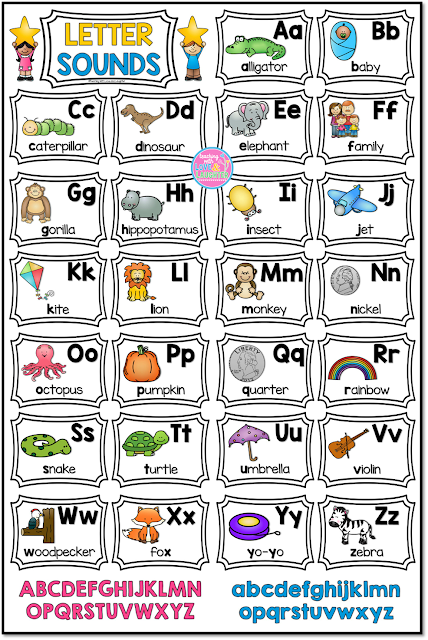 And finally, there are alphabet cards for you to hang in your classroom. They are nice and big! I added alphabet desk strips! If you already purchased this product, just download it again to get all the updates. Click the image below to see it in my store. I know that there is so much adorable clip art out there but I love seeing the DJ Inkers since I already own so much of it. This looks like a wonderful packet as usual. Thanks so much Cecilia! When I made this pack last year, I wasn't able to use DJ Inkers. I love the new look so much that I'm going to print and laminate the big poster...again! Yay! I LOVE this pack and am excited by the update! Off to download it! Thank you. I'm so glad you like this pack, Sara! Enjoy all the new editions! Ahhh! I am so excited about your updates!!! I used this last year and LOVED IT!!!! Thanks Lori!!! Lori, everything you make is gold! I told myself I would take a break from buying on TPT until August but I MUST break my rule for this. :) You are so talented my friend! You are the cutest ever!!!!!!!!!! 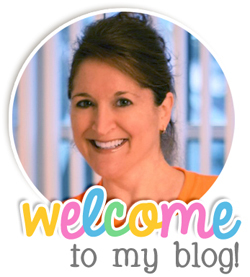 Would love to win your prize from the Christmas in July giveaway! Introducing Journeys Through the Year!